Jeep Wrangler owners are fortunate in that there are a boatload of LED lighting products out there for them to choose from. 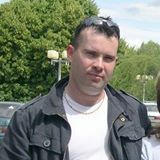 So many, in fact, that it can be difficult even narrowing down the right brand, style and size for your Jeep Wrangler. Our in-depth reviews make this winnowing process easy, though. So, read on to find the best light bar for Jeep Wrangler models from the TJs to the JKs. We have already analyzed dozens of light bars based on characteristics such as brightness, durability, beam patterns, IP ratings, ease of installation and more. Our guide leads you to a well-informed, conscious choice from top-rated light bars that brighten your way on- and off-road. This includes our number one choice, the YITAMOTOR 52-inch Jeep Wrangler light bar kit. Be assured that all chosen products are DIY installable while representing the best value for your lighting dollar. 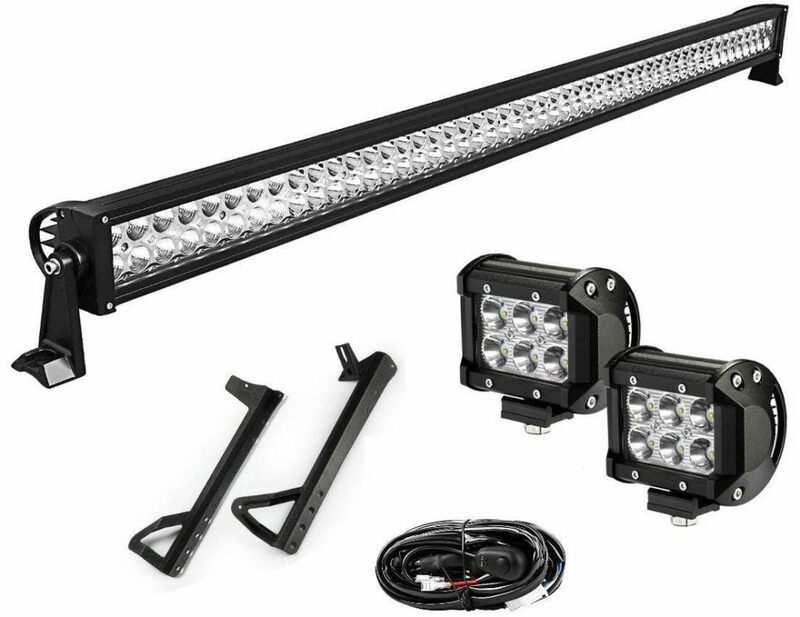 With 300W and 27,000 raw lumens of crystal white light from 50,000-hour LEDs, the Yitamotor 52-inch combo light bar kit is our top choice for extremely bright, all-weather, best off-road lights for Jeep Wrangler owners. The light bar alone makes it numero uno, but you also get mounting brackets, a complete wiring harness and two 18W fog spots. 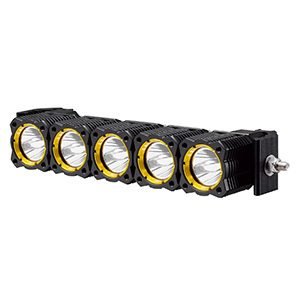 All lights are rated IP67 and enclosed in rugged aluminum behind a scratch-resistant PC lens. Buyers are pleasantly surprised by this bar’s quality and ease of installation especially. They pass up lights costing hundreds more with no regrets. One tip is to leave all mounting bolts loose to the end for easier bolt hole alignment. This best LED light bar for Jeep Wrangler brings the most bang for the buck. The 3-year warranty speaks to this bar’s quality and performance. Buy it and be the brightest Jeep in the neighborhood. This night-crushingly bright full-width, 52-inch, 27,000lm, 300W Yitamotor light bar is the same as in our top-choice review, but with specific 1997-2006 Jeep Wrangler TJ brackets and no additional light pods. 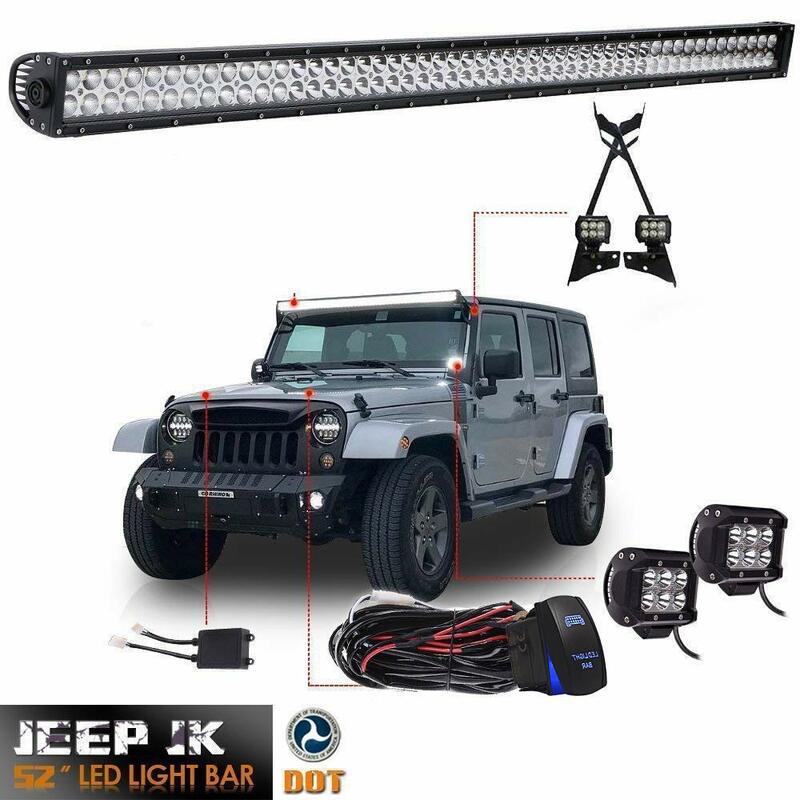 It provides the same brightness, rugged build and reliability, which makes it the best budget light bar for Jeep Wrangler with a mouth-watering price. 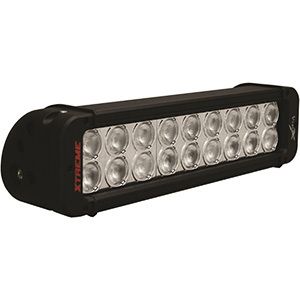 Like our top pick above, this light bar gets high marks for brightness and durability. TJ owners universally are happy with the custom fit, sharp look and high performance beams for hundreds of dollars less than the competition. This kit is just like our top-pick best Jeep Wrangler light bar except the brackets are for TJ models. Buy this model if you own a TJ and do not need the extra pod lights. Turn the road or trail from night to day. These TURBO SII 30-LED, 9000lm combo beam light bars win our praise as the most flexible, high-performance Jeep lighting solution. It is the best Jeep light bar to augment stock headlights. Their compact size, post mounts and swivel brackets support placement anywhere. They can double as work lights, camp lights, boat lights, etc. 50,000-hour LEDs provide 9,000lm inside a waterproof, dust proof IP67-rated housing built to withstand trail shocks. Buyers rank this as a Jeep Wrangler top light bar with a bargain price and superb adaptability. Owners typically mount them in the bumper or grill, as reverse lights or as tripod-mounted work lights. Easily fits Jeep Wranglers, trucks, boats, etc. TURBO 14-inch LED light bars let you own your Jeep’s trail lighting capabilities. 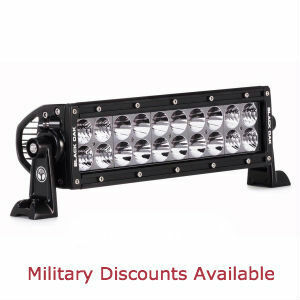 Buy two for forward or side lighting and a couple more for work or camp illumination. They let your imagination run wild. This outstanding dual-row, high-performance, best rated Jeep light bar from Racbox vanquishes dark trails with 25,000lm of 6000K light provided by 100 top-bin Cree 50,000-hour LEDs. 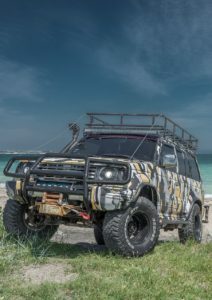 This kit includes many extras: complete wiring harness, 15-setting wireless remote control, Deutsch-style connectors, vibration dampers, custom JK mounting brackets and two 4-inch, 6-LED light pods. Buyers love the astounding brightness, features and extras of this light bar including the 15 remote flash settings. Most find the brackets easy to mount in spite of a lack of instructions. Among Jeep Wrangler roof lights, we ranked this Racbox light bar high for delivering mind-blowing brightness plus an unprecedented array of extras at an unbelievable price. Buy this for your Jeep Wrangler JK and never look back. We like the sharp look of the A-pillar mounting brackets that place TURBOSII’s full-width, 100-LED, dual-row light bar up and away from the windshield. It also features all the brightness, durability, waterproofing and extras you should expect including a bonus pair of 18W LED pod lights. One Jeep LED light bar reviewer sums up its brightness perfectly: “… surface of the sun, retina burning, tan-inducing bright.” Buyers also love the extras and how cleanly the kit installs on their Jeep. 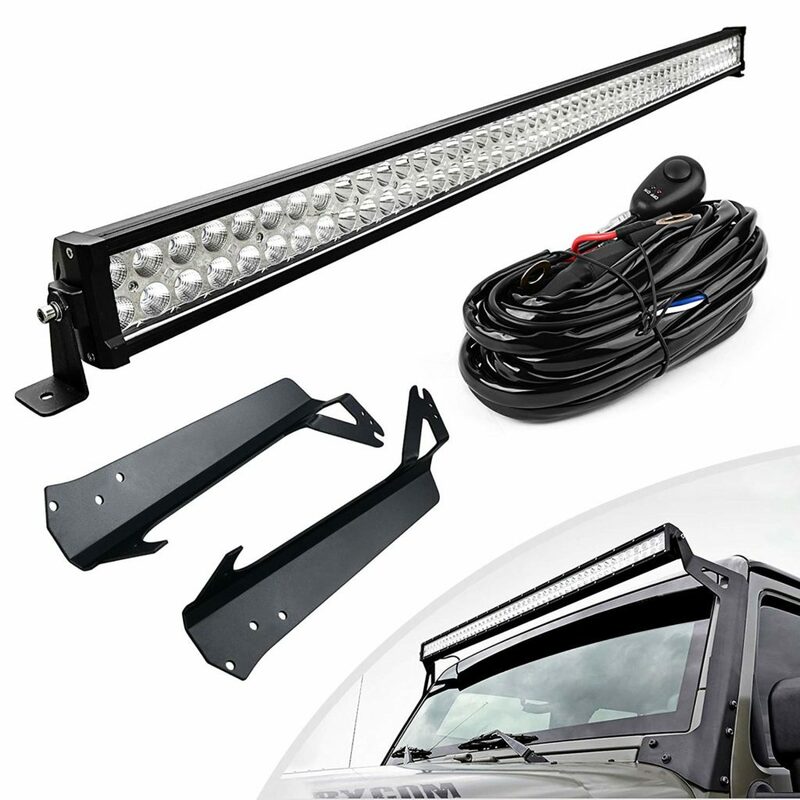 This bar/pod Jeep roof light bar kit narrowly missed being the top choice because of price. Even though it is a bit more, it is a superb value for JK, Unlimited, Sahara, etc. owners. The smooth installation and stylish look make it worth a little extra. Is this light bar bright enough or too bright for my intended use? When driving off-road, brighter is usually better, but you need to consider a light bar’s power requirements too. For off-vehicle use, the weight of longer light bars might not be convenient and their brightness may be overpowering. Does it use high-quality, 50,000-hour LEDs? The quality of the LEDs and their circuitry is key to ensuring your light bar lasts many years. All the light bars we reviewed use top names in LED lighting such as Cree or Osram. Are the cooling fins adequate to maintain a low operating temperature? Without adequate cooling, the LEDs and their circuits can overheat, which reduces the light bar’s lifespan. The light bars presented here have many deep fins integrated into the housing. The TURBOSII 14-inch light bars even textures the fins to increase surface area. Does the light bar have at least an IP67 rating? IP ratings tell you how resistant the light bar is to intrusion of moisture, dust, ice or snow. They accomplish this by eliminating seams and using quality, long-lasting seals between the housing and lens. The higher the number the better. Is the light bar rugged enough to withstand the bumps and jolts of off-road driving? Our chosen light bars are all built with rugged aluminum housings, a generous quantity of stainless steel fasteners and strong mounts to ensure they stand up to the roughest trails. First, make sure that the LED light bar you are considering purchasing fits your exact Jeep model and year. With smaller light bars using post or end mounts, this is not typically an issue as mounting options are more numerous and may not depend on body style. With light bars that mount on the windshield, there may be subtle differences in body shape that can add difficulty to the installation procedure. If you have questions about fit or are unsure about your skills in making minor modifications to the hardware or your vehicle, ask the manufacturer for advice or consult videos on YouTube that demonstrate how others surmounted installation glitches. Is There a Suitable Wiring Harness? Most Jeep Wrangler light bars come with wiring harnesses but a few do not. Even if your selected light bar comes with a harness, make sure it is long enough so you can avoid adding wire that creates a visible splice on the outside of the vehicle. Sometimes, buyer comments reveal if a wiring harness was too short for their Jeep. Often, it pays to buy a wiring harness separately, even if your kit has one, such as this high-rated Nilight Universal Wiring Kit. That kit includes the right gauge of wire and a 40A relay that can handle a 300W light bar. Is the Price Right for Me? We have carefully chosen light bars that we are confident provide high value at an affordable price. Even so, you might consider if you really need all the features of a particular product. For instance, some light bars come with “free” 4-inch light pods, but ask yourself if you really need those as they are actually part of the price. Will my Jeep light bar be street legal? 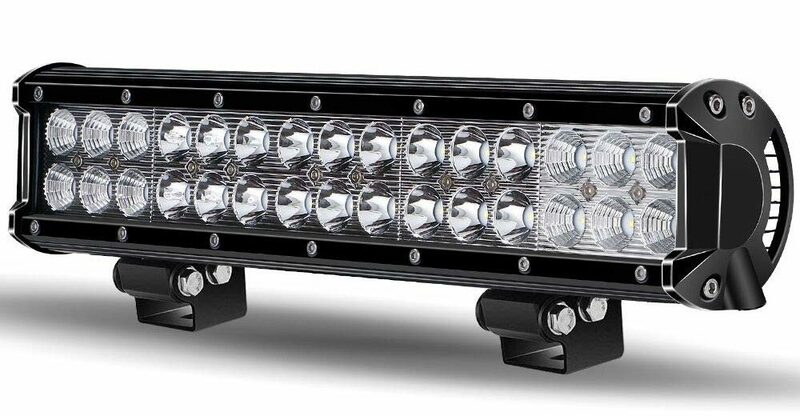 For the largest Jeep Wrangler LED light bars reviewed here, the answer is probably no with respect to driving on-road. 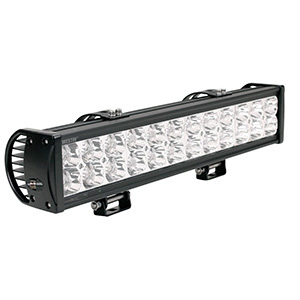 However, when purchasing any light bar, big or small, you need to be aware of any local or state transportation requirements pertaining to vehicle lighting. 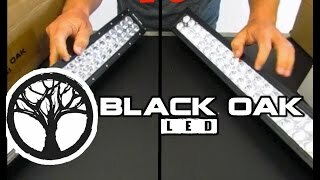 Is it better to buy one big light bar or multiple smaller ones? The price per lumen of brightness between a long and a short bar is actually surprisingly close, so the answer depends on whether you need more lighting flexibility, in which case two or more shorter bars may be better for you. Shorter bars have more mounting options, provide redundancy in case one fails and can often be used as portable lights. What should I do if my light bar fails? If you have determined that a defect in your light bar is not due to a wiring or other installation error, then you need to go back to Amazon and/or the manufacturer. 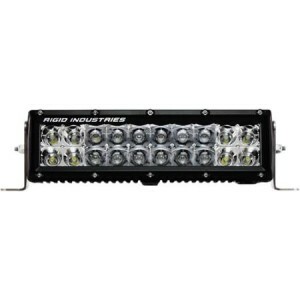 Only consider light bars with warranties of at least one year, which all the products reviewed here have, so you can get relief from the manufacturer in case a defect occurs. In fact, considering calling them with a question or two before your purchase to assess the quality of their customer service. 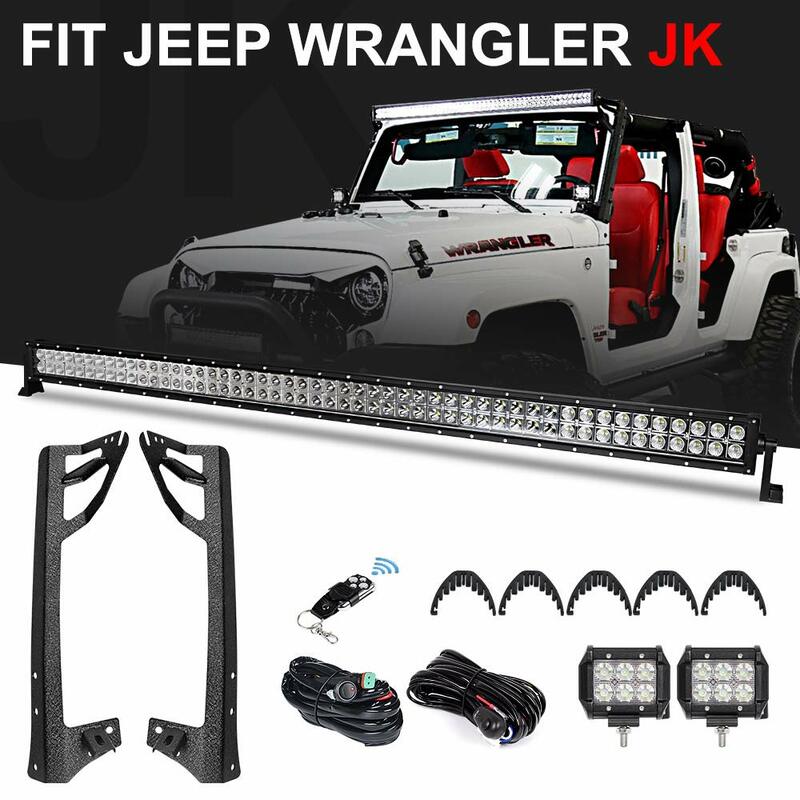 We have already done the heavy lifting of sifting through countless LED light bar products best for Jeep Wranglers and analyzing their features to bring you the best Jeep Wrangler light bar values. Now, it is your turn to select the one light bar that bestows on your Jeep the super-power of blasting the dark to smithereens. The quality and cost-efficiency of automotive LED light bars has never been higher while the costs have dropped significantly. There is no reason to pay hundreds of dollars more for light bars no brighter than the ones we have found for you. So, what are you waiting for? The best Jeep Wrangler light bars are here and backed by Amazon’s unrivaled customer service and pricing with generous return policies. Buy today and soon your Jeep will be dazzling other Jeep owners in town.